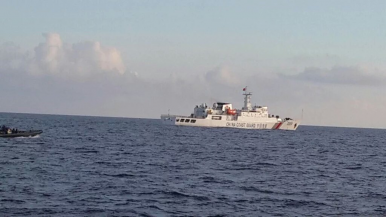 An Indonesian Navy rigid-hull inflatable boat (far left) confronts a Chinese Coast Guard vessel near Natuna Island. The Natunas: Why Is Indonesia Developing A South China Sea Flashpoint? We need to look beyond the headlines for a realistic assessment of what Jakarta wants and what it might get. Indonesia’s resource-rich Natuna Islands, located in the South China Sea northwest of Borneo, tend to be subject to periodic hype from the international media. That’s due to a couple of reasons. For one, though Indonesia is not officially a claimant in the South China Sea disputes, China’s nine-dash line overlaps with the exclusive economic zone (EEZ) around the Natunas (See: “Indonesia’s South China Sea Policy: A Delicate Equilibrium”). Moreover, with Indonesian President Joko “Jokowi” Widodo taking a tougher line on defending Indonesia’s sovereignty and a number of recent run-ins between Indonesian and Chinese vessels near the Natunas this year, the issue has been dominating the headlines (See: “China’s Maritime Confrontation with Indonesia is Not New”). Indeed, Jokowi himself made news in July when he made his first visit to Natuna aboard a warship in a far-from-subtle display of Indonesia’s sovereignty over the area. But even apart from the China angle that is often hyped up, Indonesia’s commitment to developing the rich resources in the Natunas also makes sense for economic reasons. Focusing on just the energy aspect of this alone (fisheries, too, is a priority) Indonesian government has said that there are seven oil and gas exploitation fields and ten exploration fields there. To get a sense of the potential here, consider the fact that the East Natuna block on its own is said to have over 46 trillion cubic feet of gas, making it Asia’s largest gas reserve. For these mix of reasons, we have seen a flood of commentary about how the Indonesian government would like to “expedite” the development of resources in the Natunas over the next few years. During Jokowi’s cabinet meeting in the Natunas in July – his first ever visit there – he said he would like to push development in the area “so that they enter production stage sooner.” The Indonesian government has also pledged to take other steps to accelerate resource development in the Natunas, which include drafting a special regulation which would offer incentives to investors. With regard to the East Natuna block in particular, the government has asked a consortium comprising the state-owned oil and gas company Pertamina, U.S.-based ExxonMobil, and Thailand’s PTT Exploration and Production (PTT EP) to consider wells to produce oil even as they continue to study the potential for gas in the area (government estimates suggest that oil production can start after three years of development). The government hopes a contract can be inked for oil and gas cooperation by the end of the year and that we could see resource production begin as early as 2019, even though some in the private sector have previously said this timeline might be too optimistic. Some have said there might be hopes for operation to start before 2030. Pertamina, for its part, has indicated its support for this government effort. “The government needs to have activities around the borders and one of Pertamina’s strategies is to support this,” the upstream director of the company Syamsu Alam told reporters in an interview back in April. This week, we saw another one of these related headlines. On August 25, local media outlets quoted a Pertamina official as saying that it expects to sign a production-sharing contract (PSC) for the East Natuna gas block in Indonesia with Exxon Mobil and Thailand’s PTEEP in September. Meidawati, the senior vice president for upstream strategic planning and operation evaluation, said terms and conditions are being finalized before the imminent inking of the agreement. These companies have already been part of a consortium, and they had inked a principles of agreement with the Indonesian government for a new PSC to develop the bloc which was extended for 30 months last December. ExxonMobil said that the extension was based on the need to further assess prospects for commercializing the resources. The signing of the PSC is a key step to take before development occurs. To risk stating the obvious, one needs to work out who owns what before moving towards potential production. However, as promising as this development is, as with others like it, it needs to be kept in perspective. Exploration for resources in the Natunas has been an ongoing development, and though it has captured more international media attention over the past few years, it is in fact far from a new trend. One also needs to be cautious when assessing just how lucrative certain opportunities. In the case of the East Natuna block, for example, though the potential is certainly there, due to the high level of carbon dioxide present, it will require advanced technologies – and hence tens of billions in investment – to actually start making headway towards producing gas from there, assuming that the production numbers actually bear out. And even if Indonesia does manage to begin tapping these massive reserves, it would need to then figure out the best way to channel that. One idea is a pipeline constructed from East Natuna to Batam and Kalimantan (though that too is far more challenging to actually carry out than it seems). So, while we ought not to dismiss the value of the Natunas to Indonesia or its potential, we should also be cautious about reading too much into the sporadic headlines regarding these “resource-rich” areas.